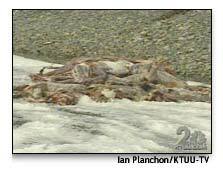 Palmer, Alaska - A Mat-Su man discovered more than two dozen skinned carcasses in a pile along the Knik River this weekend, about a quarter-mile from the Old Glenn Highway. It was apparently a trapper's cache and, according to Alaska State Troopers, it's not uncommon to find such piles at this time of year. For someone not familiar with trapping, it was hard to determine what kind of animals these were. 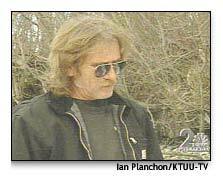 For Ed Krueger, who describes himself as "hardly" an animal rights activist, the discovery was difficult to stomach. "My friend and I were out walking our dogs and happened to come across it," Krueger said. "Even my dog wouldn't touch these." It was a sickening surprise. "I counted at least 35. They're all intermingled underneath here, and it's hard to really, I'm not going to pull them apart, but I counted at least 35." The animals were skinned for their furs. "It's disgusting. It's unbelievable," Krueger said. John Frey, a deputy officer with Mat-Su Animal Care and Regulation, said a trapper apparently picked this spot to dump the animal remains, also called a trapper's cache. "You got everything from coyotes, these big guys in here are wolves," Frey says. "Right now, I guess, I was told the heads are going for about $100 a skull." They all appeared to be fur-bearing animals that can be legally hunted. 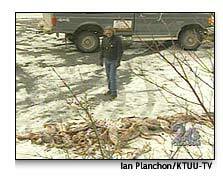 "It looks like this guy did quite well on his trap line," said Douglas Massie of the Alaska State Troopers. For Krueger, it was a disturbing discovery. 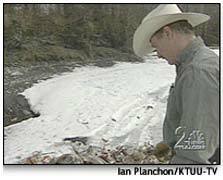 But troopers say it is not uncommon or even illegal for trappers to dump the carcasses of animals in a public place. "Obviously, you can't dump it in a public park or designated state park," Massie said, but he admits the trapper could have picked a better place, rather than this heavily used recreational area. Krueger said he'd like to see these animals buried. "At least show some sort of respect for life." 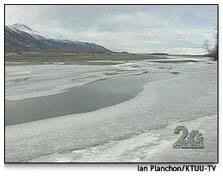 While state hunting and trapping laws weren't violated here on the banks of the Knik River, one man believes that, legal or not, there should have been a better way to deal with these animals after the hunt. At the Board of Game meeting Monday, several trappers themselves said this kind of disposal casts a bad shadow on all trappers. They said they wish whoever disposed of these animals would have used a little more discretion. Troopers said they plan to just leave the carcasses for birds and other animals to eat, and the pile should be nothing but bones in a few weeks.